Truth be told, I couldn’t care less to choose the Zutons to be featured or not. I’ve had their track, ‘Valerie’ in my playlist for quite awhile now; first time I gave a listen to it, I thought it was pretty good and it was definitely a keeper, albeit that it didn’t really stand out compared to the other songs I had. But then came this one time, at McDonalds (can you believe that, McDonalds? ), a really familiar tune was being played. I was like, ‘Hey, I’ve heard this song before…’ but I couldn’t remember what it was and I couldn’t entirely explain to myself why I felt that it was important that I remembered what the song was. But, as soon as the words in the song go; Valerie…! Then all the memories come flooding back. It’s a huge surprise to be able to listen to Zutons’ ‘Valerie’ at a place like McDonalds, because places as such usually only cares to play music that flows in the ‘mainstream’. The thing that I can’t really get my head around is the fact that why oh why does ‘Valerie’ sound so much more appealing when being played in McDonalds compared to well – my laptop? ; it’s sound so much better when being played out in the open. Ever since that day, the way I looked at that one Zutons’ song was never the same again; it managed to stand out in its own way - whatever that ‘way’ was. 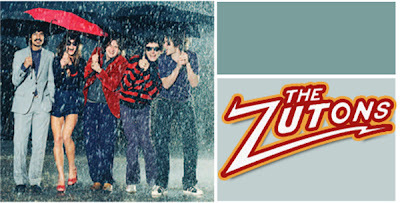 The Zutons is a band from Liverpool who formed waaaay back in 2001, they’re a band that’s been around for a lot longer than I expected. So now, I’ll leave you with my most fave song from the Zutons.